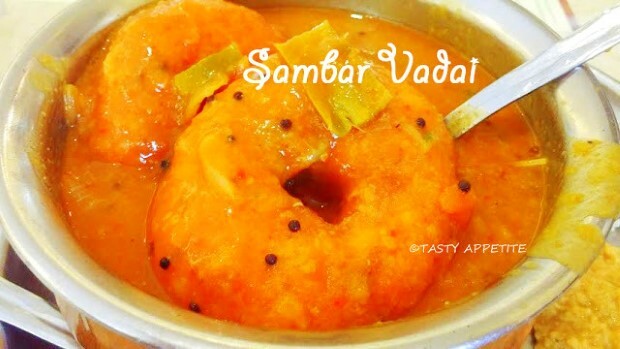 Here comes the traditional south Indian style sambar vadai recipe. Its one of the most favorite delightful breakfast dish that is popular in all restaurants. The crispy delicious vadas are soaked in piping hot sambar to make it soft and garnished with chopped onions, coriander leaves and a drizzle of ghee. This traditional south Indian dish can be served as a main course, snack or side dish. Check out this quick video recipe to try this yummy healthy sambar vada at your home! Wash and soak urad dal in 3 cups of water for 1 hour. Meanwhile lets prepare sambar. Wash and soak toor dal in water for 5 mins. Drain water and add it to pressure cooker. Add 3 cups of water and pressure cook until soft. Heat gingely oil and ghee in fry pan or kadai. Add mustard, cumin, split urad dal, curry leaves, green chilli and red chilli. Add sliced onions, salt and saute until light brown. Add turmeric pwd, red chilli pwd, coriander pwd and saute. Add mashed dal and combine. Adjust the thickness of sambar by adding required water. Add thick tamarind juice and combine. Add sambar pwd and allow to boil for few minutes. Garnish with freshly chopped curry and coriander leaves. Flavorful delicious sambar is ready. Drain water from the soaked urad dal. Add salt and grind to coarse paste. Add the smooth batter to mixing bowl. Add chopped curry and coriander leaves, sliced onions, green chilli, ginger, hing and combine. Wet your hands with water and take a small portion of the batter. Pat it flat and make a small dent at the centre as shown in video. Drop it carefully in hot oil. Flip to other side and deep fry until the vadas are crispy and golden in both sides. Crispy delicious vadas are ready. Take 1 cup of water water in a bowl. Add the vadas and allow to soak for few minutes. Squeeze the water and add the soft vadas to serving bowl. Pour hot sambar over the vadas. Garnish with finely sliced onions, coriander leaves. Healthy delicious restaurant style sambar vada is ready.